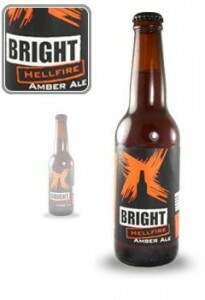 The Hellfire Amber Ale is an aromatic and moderately bitter amber ale with a clean, dry finish, leaving your mouth ready for another. There is light carbonation with predominantly malt and caramel flavors. Though the body is a bit weighty, it still remains refreshing. Overall, it lives up to its interesting name as embers of flavour linger on the tongue after the last sip.